Environment and culture are two major factors in determining the likelihood of educational achievement, but the educational system where the student learns is also very important. It is very difficult to change the culture or environment where children grow up, but it is more possible to improve the school system which they attend in order to give them the best chance at success. Unfortunately, many schools in the United States have been failing to provide this support and the children of the United States have been suffering. While standardized tests are extremely iffy on their ability to measure academic ability, they are the tool that is used to measure international educational standards. According to the 2010 PISA report by the OECD—the Organization for Economic Co-operation and Development is a group of the most developed nations—the USA currently ranks 14th out of the 34 OECD countries. More specifically, American students rank 14th in reading comprehension, 17th in science and 25th in math. As the richest nation on earth, the USA should not be ranking this low on education and the PISA report illustrates that there is a very real problem with our current educational system. In the United States educational system, many things have eroded the quality of our schools and threatened to reduce our ability to educate our next generation. Such problems are numerous, but the major ones are: The push to privatize/voucherize schools, reductions in school funding, inadequate math/science programs, a dependence on flawed standardized tests, and massive disparities in educational quality between locales. These problems are systemic, not local, and must be fixed at a societal level if the United States wishes to improve the quality of its educational system. In the face of budget shortfalls and decreased tax revenue, many school systems in the United States have cut their educational programs. These cuts, while effective in reducing budget shortfalls, are counterproductive in that they cause lasting damage to the education of the students who attend schools affected by the cuts. In the long run, it is highly likely that these cuts will cause enough damage to the educations of our future generations that the costs will far far-outstrip the short-term benefits of cutting budgets. Schools which have had their funding cut have had to decrease the services that they provide to their students. These cuts often occur at the expense of the educational quality of the institution and are harmful to students. Most commonly, schools have reacted to budget cuts by reducing or ending their extracurricular programs, extra help programs, and non-essential classes (gym, band, etc. ); this stripping of education to the bare essentials prevents students from receiving a well-rounded education and often leads to behavioral problems (bored kids left unattended after school while parents are at work). In addition to cutting programs, schools will often react to budget cuts by forcing students to share resources—such as computers or textbooks—and by letting their facilities fall into a state of disrepair. Due to the problems created when schools cut programs and services, schools without proper funding are statistically less likely to provide a quality education than schools which have sufficient funding. The budget holes of some states have become so large, and the cuts to schools so deep, that some schools have begun making drastic and terrible cuts to their programs. Many school districts in the United States have begun shortening the school year, and over 120 school districts have gone as far as making the school week 4 days instead of 5. In a situation where our country’s quality of education is already faltering, the very last thing which we should be doing is cutting down on the time which children attend school. Contrary to the arguments of those who support education privatization, private schools are not always superior to public schools—we need only look at the disastrous results of for-profit universities to see evidence of this fact. On average, private schools are no better than public schools. Private schools which have superior results to public schools often only admit high-functioning students, have significantly larger budgets, and often are attended by children with unusually large amounts of personal resources; these schools are rare, expensive, and in no way represent the average private school. When a government embraces school privatization, its public schools lose significant amounts of money and high functioning students to private schools. Money which should go to the public school system is diverted to private schools through the voucher system, thus the public schools gradually decay—this decay of the public school is often then used to justify further privatization. Students who are unable to afford entry/test into a prestigious private school face the choice of attending the defunded public schools, attending religious school (affordable private schools), or attending an inferior private school. Mass-privatization of an educational system creates a stratified system of education: at the top, there is a small minority of students who have the money to attend a high-quality private school and receive a superior education; on the bottom, there is the vast majority who are left to the mercy of predatory for-profit schools or relegated to a decayed public school. Many school systems within the United States have become reliant upon standardized tests to determine achievement by their schools and teachers; this method of assessment is not only flawed but it breeds an incentive for teachers to teach towards a test rather than to simply teach. By utilizing a flawed method to assess educational success, the United States has created a flawed educational policy regime. Due to the fact that a majority of school funding is raised on the state level, state politics and wealth have large effects on the level of funding given to public schools. First of all, some states are wealthier than others (ex. New York is more wealthy than Wyoming) and have more possible funding streams for their schools. That said, what is a larger factor than even the total money available is the state-level politics that controls just how much money is collected to fund schools. It matters little if you live in a wealthy state if your state government has cut taxes to the point where none of that wealth is collected to fund public services. Some states, most of which are controlled by Republicans, have decreased the amount of money dedicated to education far more than others, thus have created an educational disparity between states. 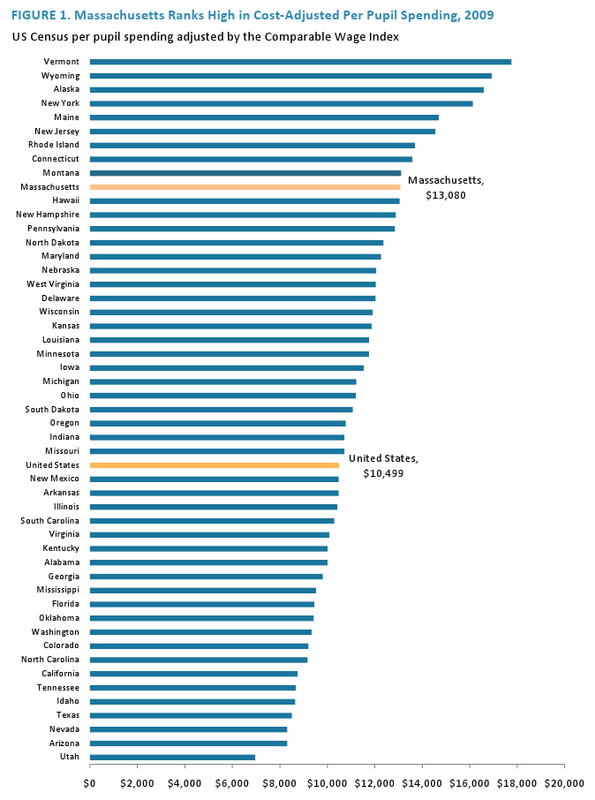 As you can see in the graph below, students attending school in Vermont (the highest) receive nearly two and a half times the educational funding than those living in Utah (the lowest). This disparity is extreme, and creates a situation where educational opportunity is determined by geography. Many states—such as Texas and Nevada—have enacted crippling budget cuts upon schools, thus students living in these states are robbed of opportunity. Without the ability to learn, these students will be at a disadvantage when competing against students from other states and countries, as well as students from high-quality private schools. At the end of the day, the American public schools are faltering and there appears to be little chance that they will be improved any time soon. A toxic political climate has prevented any real positive action to improve education policy and the funding of many public schools is still being cut—at this point, the cuts are beyond simply going to the bone, and are beginning to amputate limbs. When the cuts to public schools are combined with flawed testing measures and brain-draining privatization, the result is a faltering public education system that turns out millions of students who are unprepared for higher education and skilled employment. 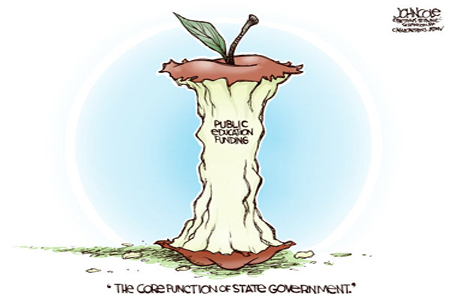 We must stop cannibalizing our public schools/services in order to balance our budgets. Sacrificing our next generation’s education for the mistakes of the last generation is both unfair and terribly short-sighted. Do you think maybe that schools are becoming obsolete for the future? I mean, they were designed to create skilled individuals that provided the labor for the industrial revolution. We are way past that time – what we need now is creativity. We need students to love learning and apply their knowledge to create miracles we can’t even dream of. I think that our current school model is becoming obsolete, but this doesn’t mean that the entire idea of a public school system is. We certainly need to update our schools in order to serve the modern market (ex. promoting more creative and individually tailored education), but our schools still have very valid functions beyond simple education. They serve to catch mental illness, provide people a basic level of skills that serve to promote a functional society (math/reading/writing), and act as an extremely important place for kids to spend their days when their parents are working. Personally, I would support shifting to a combination of the vocational tracking of the German schools, coupled with the academic flexibility of the Israeli or Icelandic educational systems. This would allow the highest degree of flexibility to students to pursue their interests and would help alleviate much of the educational stagnation that threatens our country. I will watch the videos that you sent me, thanks. Many good points are made here. Children are caught in the hustle of profits over people. And if the corporate capitalists can’t make dollars off of them in the schools they’ll make at the other end of the pipeline in the prisons. Well written article and most of my frustrations with public school as a parent are noted here. I am considering emailing this to my school system’s superintendent. Our children can’t read very well and the teachers totally teach to the SOL tests, which is not teaching my son what he “needs” to know. Your articulation is much better than mine would be….. Thanks for the interesting article. Pingback: Tennessee Dad: The Refugees Among Us Now | pgcps mess - Reform Sasscer without delay. Pingback: Tennessee Dad: The Refugees Among Us Now | Help Change The World. The Future Of The County Is Now.